Can you believe that today my baby Kristin turned sweet 16!! Let’s celebrate this lovely day with my newest pattern I am so glad to offer you for free download. Anemone, which means “daughter of the wind” in Greek is a symbol of undying love and anticipation. 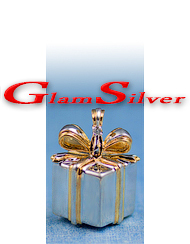 They also symbolize sincerity due to their delicate appearance and sure will make a great gift for your loved ones. 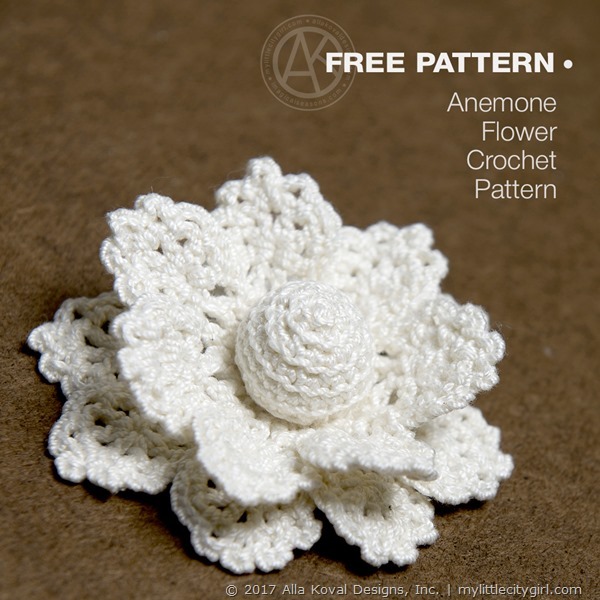 This lacy flower can be crocheted in any colors and yarn weight you would prefer, and will make a lovely addition to a hat, headband, coat, handbag, gift packaging or any other project you please. Omega Cotton Thread #5 (100% cotton; 164 yd [150 m]/1.76 oz [50 g]): 1 ball of #51 cream. 10 pages, 1 photo, 2 crochet stitch diagrams, technical pages: Glossary, Conversion charts. To enjoy AllaKovalDesigns™ deals, please visit my Etsy, Ravelry, Amazon and ImagicalSeasons.com stores. Let me introduce Rampion Pin pattern. Such a fun technique to create flowers or whatever you can think of …even if you don’t knit. Just minimal crochet skills required! 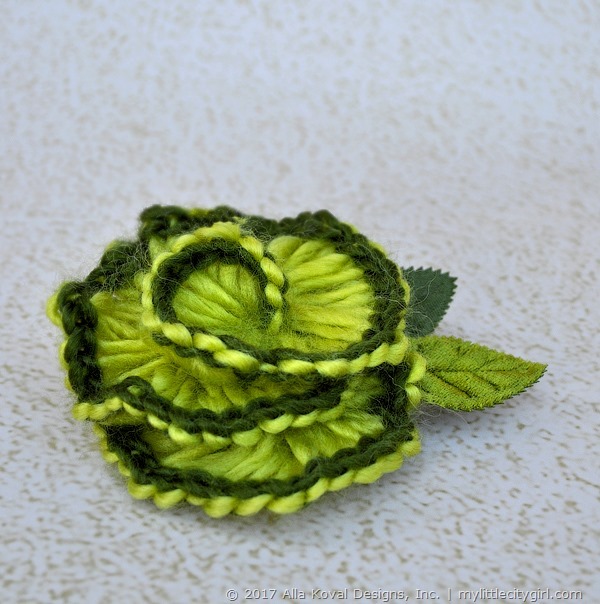 Crafted in a graceful spiral and trimmed with contrasting slip stitch, this elegant pin mimics the flowers Rapunzel’s mother craved. 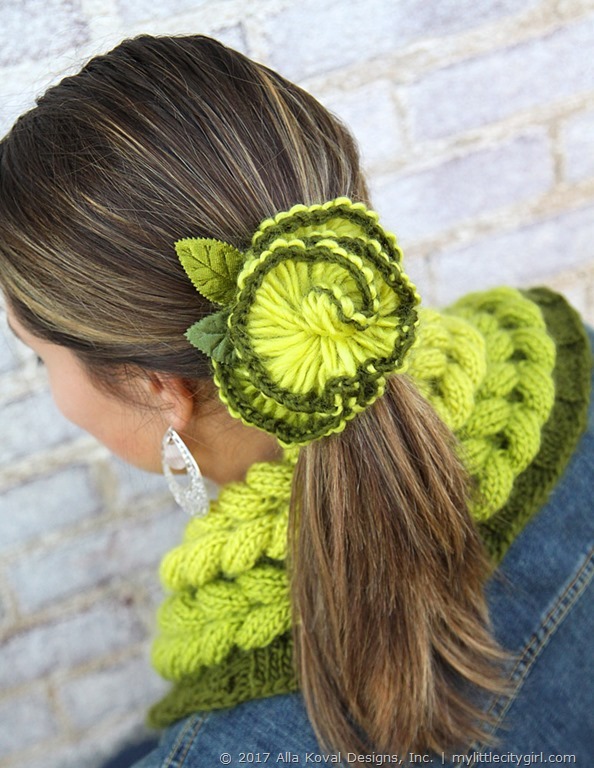 Wear it in your hair or pinned to your dress …or make a bunch of flowers, join and turn them into a scarf! Shown: Sheep(ish) from Caron (70% Acrylic, 30% Wool; 167 yd [153 m]/3 oz [85 g]): 1 skein each of #0021 lime(ish) (MC), #0019 olive(ish) (CC). [100 g]): 1 skein of each main color (MC), contrasting color (CC). 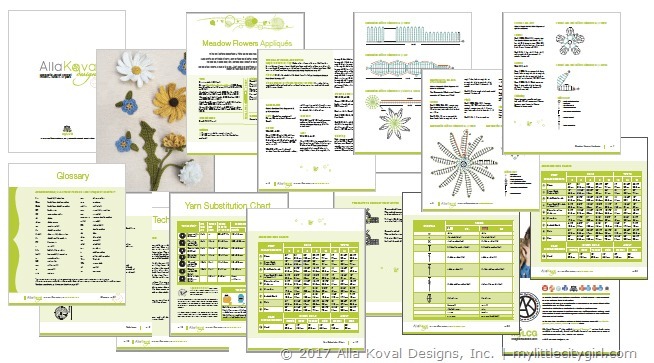 12 pages, 2 photos, crochet stitch diagram, tutorial, technical pages: Glossary, Magic (Adjustable) Ring Tutorial, Conversion charts, Yarn Substitution Chart, Yarn Care Symbols Chart. 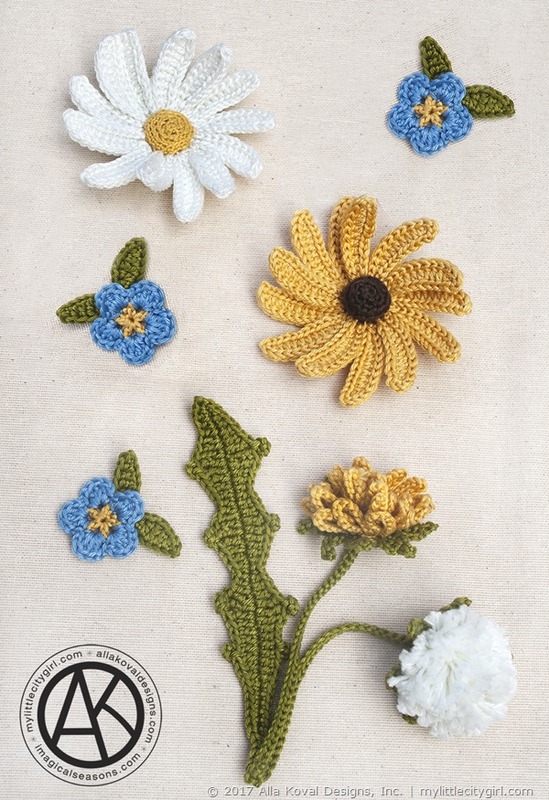 Meadow Flowers Appliqués | Free Crochet Pattern + MORE! YAY, March is here!!! Spring in the air and I am so ready for Spring to come. I can’t wait for the sun to shine, the flowers to bloom, and to put away rain coats. It’s a time of rebirth, a time of enjoying the great outdoors and breathe in clean spring air. 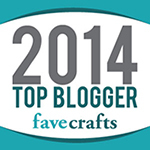 And it’s National Craft Month and I want to celebrate with You! 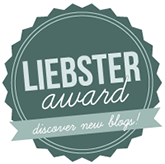 Check out of the all ♥ ♥ ♥ SPECIAL DEALS ♥ ♥ ♥ I have for You! Think springtime sweetness, think fields and meadows filled with wild flowers! Made with sport weight yarn, any of these delicate flowers will make a lovely addition to a hat, handbag, headband, pin, scrapbook layout or any other project you can think off. 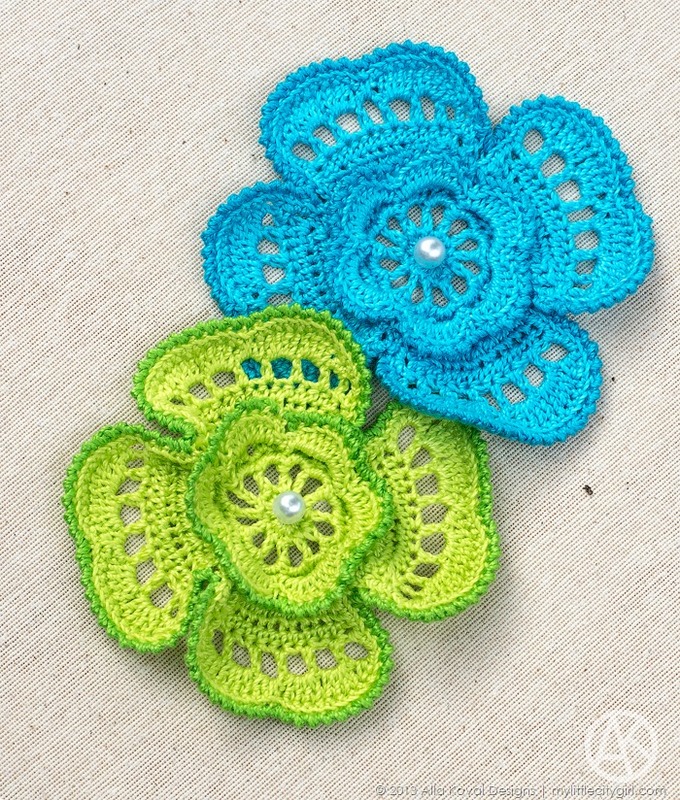 Double the layers, double the fun—just add crochet two Marguerite flowers, and turn appliqué into beautiful two layers pin or hair accessory! Shown: Nazli Gelin Garden 3 Yarn (100% Egyptian Giza Mercerized Cotton; 136 yd [125 m]/1.75 oz [50 g]). Dandelion: 1 ball of each #300-3 yellow (MC), #300-02 white (CC1) and #300-17 fern (CC2). Marguerite: 1 ball of each #300-3 yellow (MC) and #300-02 white (CC1). Black-Eyed-Susan: 1 ball of each #300-3 yellow (MC) and #300-22 dark brown (CC1). Forget-Me-Not: 1 ball of each #300-11 medium blue (MC), #300-3 yellow (CC1) and #300-17 fern (CC2). 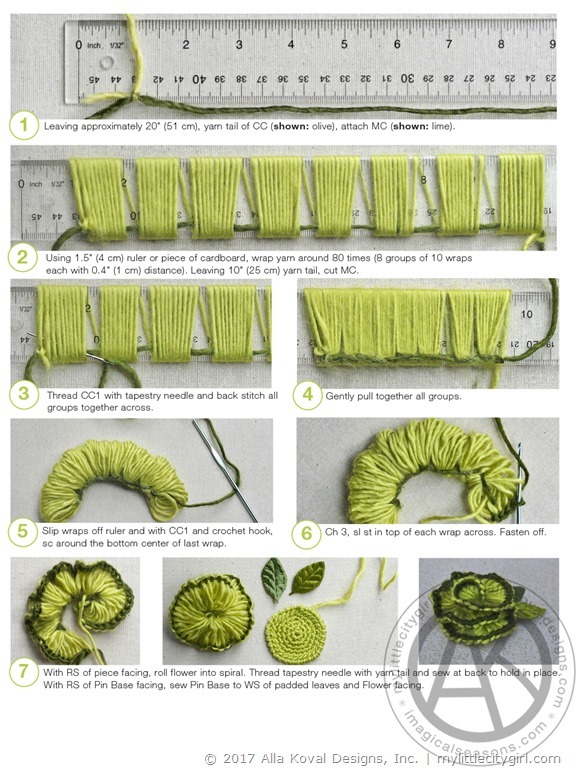 16 pages, 2 photos, 7 crochet stitch diagrams, 3 tutorials, technical pages: Glossary, Terms, Two Ways To Crochet Picot Tutorial, Magic (Adjustable) Ring Tutorial, Making a Pompom Tutorial, Conversion charts, Yarn Substitution Chart, Yarn Care Symbols Chart. …. 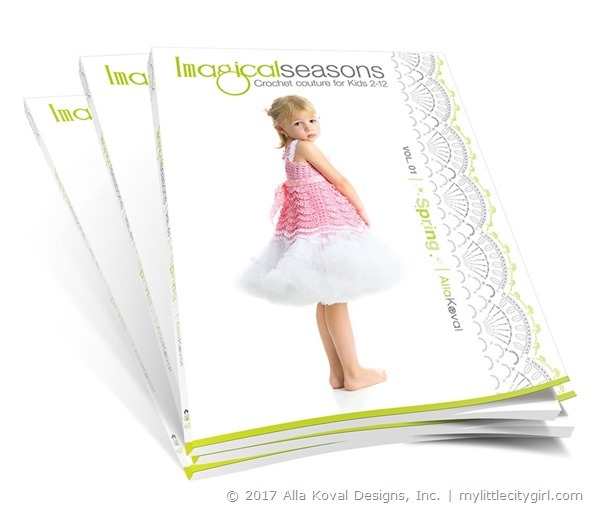 And very ♥ ♥ ♥ SPECIAL DEAL, get 30% off on all my patterns and Imagical Seasons crochet pattern books* in both paperback and digital formats + Free Tax (US) and Free Shipping (within US) …. for the entire month!! Use promo code MARCHLOVE at checkout. This coupon is applicable to my Patterns Shop, Etsy, Ravelry and ImagicalSeasons.com. This offer last through March 31th 2017 at 11:59 pm PST time. 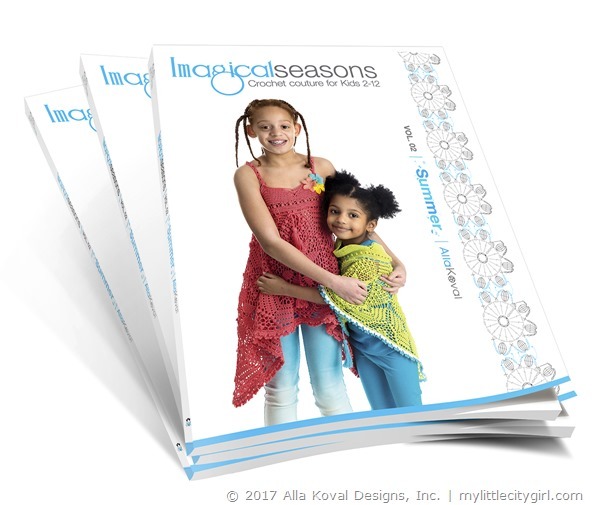 * To look inside my crochet pattern books, please visit my Amazon store. … but most exciting thing is that this pattern was downloaded 230,635 times so far… WOW, I am speechless and so grateful for your interest in my work! So I decided to pick this pattern and update it to match my current style. What was changed? First of all, yarn which was used in 2011 is discontinued already. New sample was made with my absolute favorite wool and silk blend by Cascade Yarns Venezia Sport! 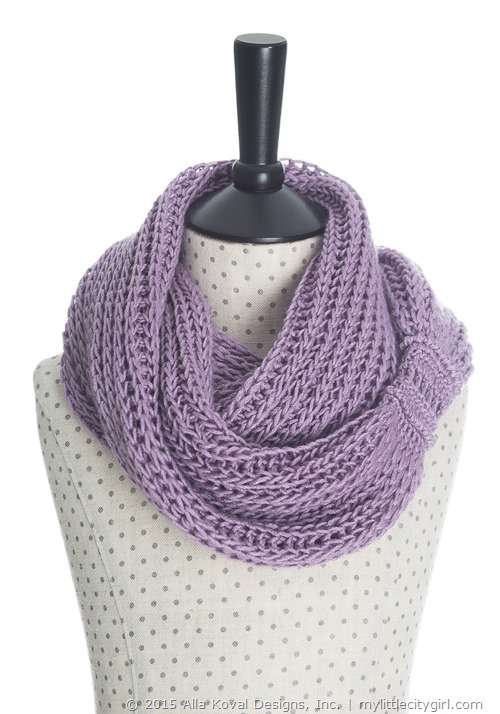 Treat yourself and yours with cowl, scarf or whatever you can think off made with this fabulous and oh so luxury yarn! Third, written instructions. Instructions are different and much more clear. They come with tons of tips and have more details. 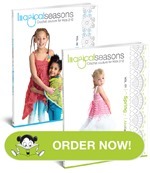 Plus technical pages, tables, tutorials. Fourth, stich diagrams for crochet band and finishing edging! Diagrams are all new (there were no diagrams in original pattern) and will make this pattern even more user friendly! So, below are details and link to download this old-new pattern. Lightweight and delicate as meringue dessert, this cowl makes most enjoyable treat. 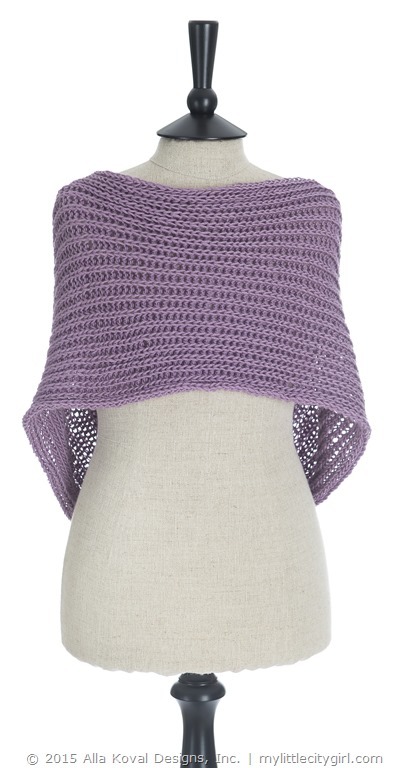 Luxurious and chic, versatile and playful, this delicacy of a cowl is hand-knitted in wool and silk blend yarn. 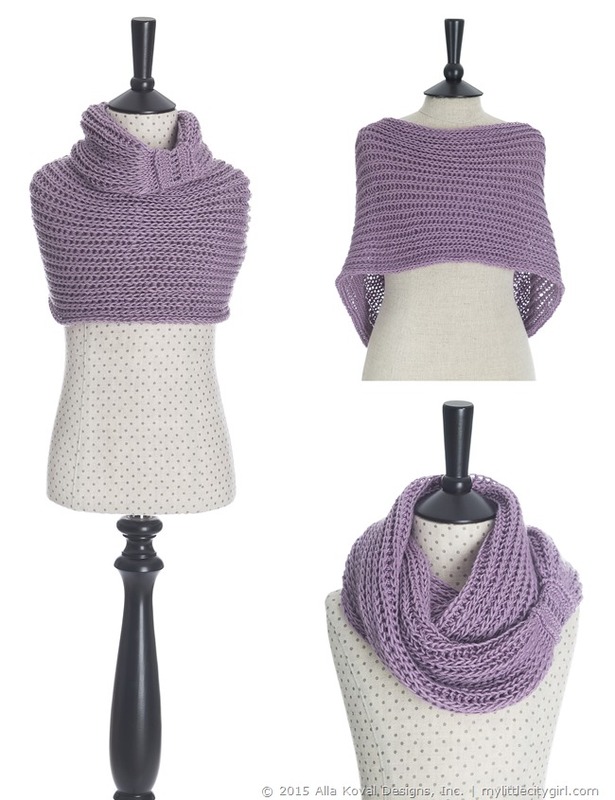 The cowl features an airy brioche stitch pattern and adorned with crocheted band. Stretchy, cozy, and generously sized, it has a beautiful drape, and can be looped around your neck twice for extra warmth. Treat yourself of a loved ones to this delightful winter! Opt for bamboo or cotton blends for fall and spring accessory. Shown: Cascade Yarns Venezia Sport (70% merino wool, 30% silk; 307.5 yd [281 m]/3.5 oz [100 g]): 1 (2, 2) hank(s) of #101 white heaven. * This pattern involves both, knit and crochet skills. 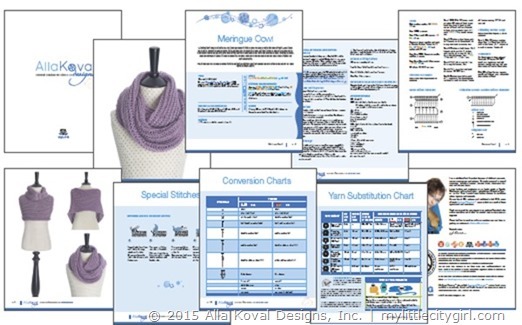 10 pages, 3 photos, 2 stitch diagrams, technical pages: Special Stitches Tutorial, Conversion Chart, Yarn Substitution Chart. NOTE: If you are not familiar with Brioche knitting, sure you can google “Brioche knitting“ to find free video tutorials. But if you want to learn everything about this lovely stitch, I would highly recommend Learn Brioche knitting basics and beyond with Faina Goberstein during this knitting webinar. Unauthorized distribution or duplication is a violation of applicable laws. This pattern has not been tech edited, so if you find any mistakes or typos, please let me know and I will fix it. A wonderful and lovely day to You all!! 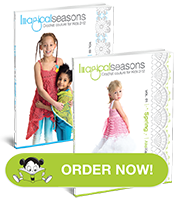 Make the ultimate in fine lace for your little one! 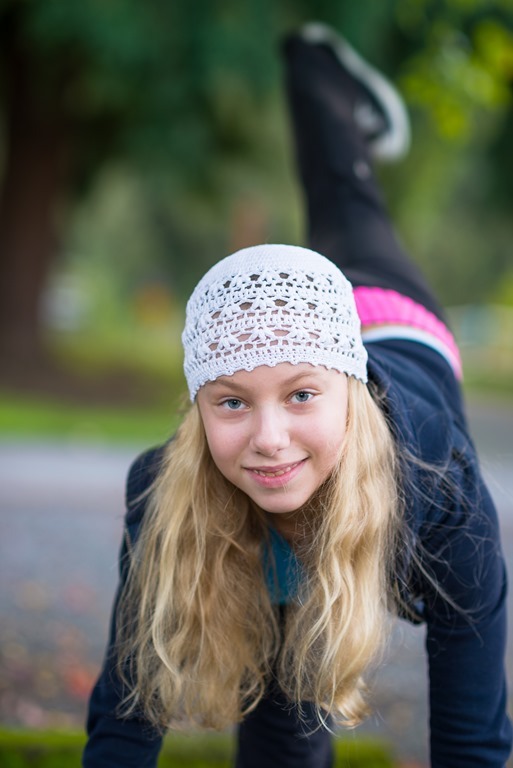 Simplicity and sweetness come together in this elegant beanie, suitable for ladies of all ages! Its refreshing beauty is sure to delight the lucky wearer, especially when made in her favorite color! Need a last minute gift? This beanie will make for that nice touch. Opt for wool or mohair yarn to make a beanie suitable for colder weather. You can even add metallic or silvery threads to make this beanie the perfect holiday gift! Hat shown is a size Large/Youth. Beanie shown is size Medium/Child. 16.5 (18.5, 20.25, 22.25)” (42 [47, 51.5, 56.5] cm) circumference, unstretched. Shown: Omega Cotton Thread #5 (100% cotton; 164 yd [150 m]/1.76 oz [50 g]): 1 (1, 1, 2) ball(s) of #50 white. 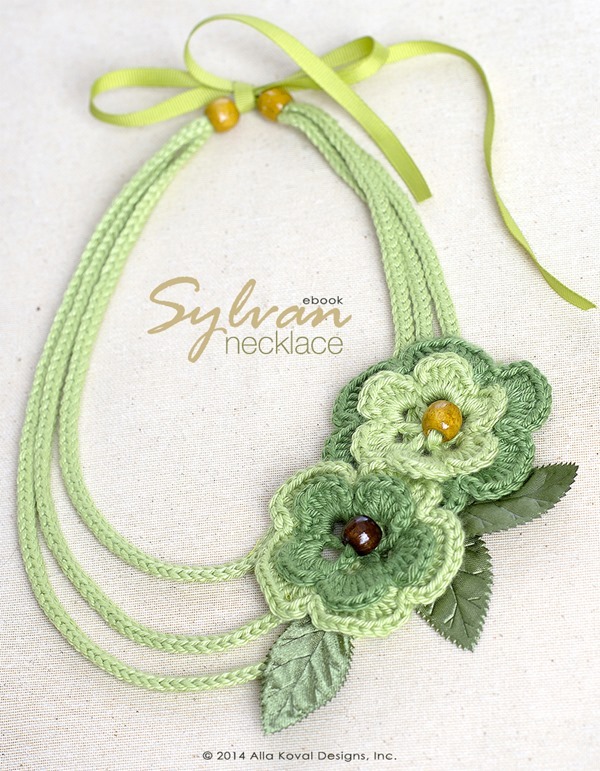 Walk in woods any time of the year with the Sylvan Necklace, suitable for wearers of all ages! 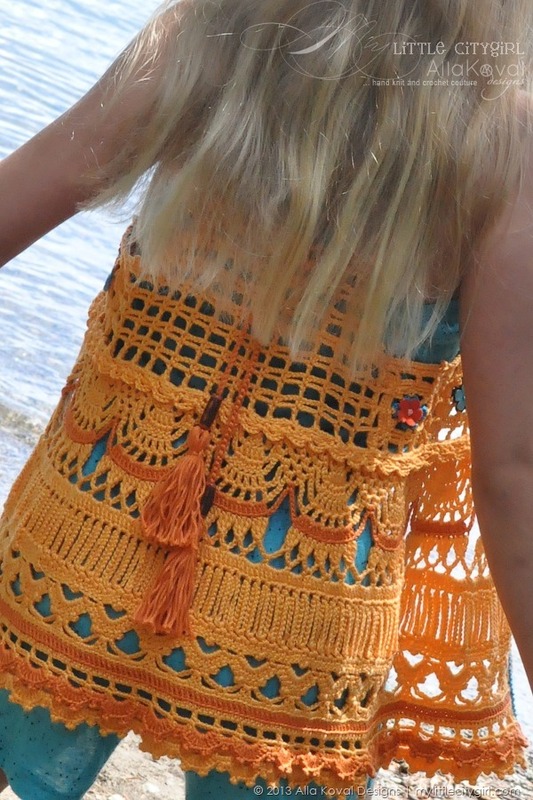 This free pattern is very versatile. Crochet the chains in equal length to create a fun headband or even belt! 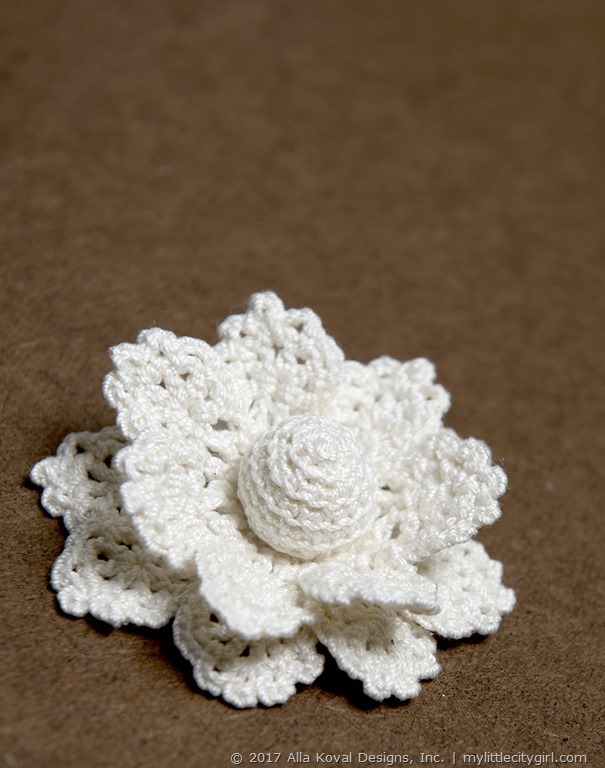 Or just crochet the flowers to create a cute Flower pin or brooch. The necklace can be made using a wide range of yarn weights, from fine to medium and bulky weight yarns, for any season or occasion. Work it in jewel tones or pastels, in solid colors or softly variegated shades for a one-of-a-kind accessory! A perfect gift idea! 18″ (46 cm) in diameter. Adjustable by ribbon ties to any size. Shown: Cascade Yarns Ultra Pima (100% pima cotton; 220 yd [200 m]/3.5 oz [100 g]): 1 ball each of #3742 mint (MC) and #3740 sprout (CC). It was such a fan to test my own Design Your Hat pattern, and I’m so glad I’ve got a chance this weekend to do it. Not to mention that these hats really take just 2-3 hours of crocheting, and about 1-2 ball(s) of yarn! The orange brim hat is made with Omega Sinfonia (100% mercerized cotton; 218 yd [199 m]/3.52 oz [100 g]). The only difference is that I’ve added 4 sc-rows in contrasting brown and turquoise respectively. The other news I’m upgrading my computer now, and just realized how much time (and patience!) it really takes… But I needed these changes badly, and I really hope everything will be back to normal pretty soon. In any case… if there is 4-5 days of delay with my response to your email – please just let me know, probably I’ve unfortunately missed it. Crochet the versatile hat or design your own—with brim or in beanie style, worked with any yarn weight and any stitch pattern with these easy to follow instructions and crochet diagrams. Refer to tip notes to get ideas and suggestions. Plus, the pattern includes a Bonus Stitch Diagram for Crown! The hats make incredible presents that recipients of all ages love! There are an infinite variety of ability! 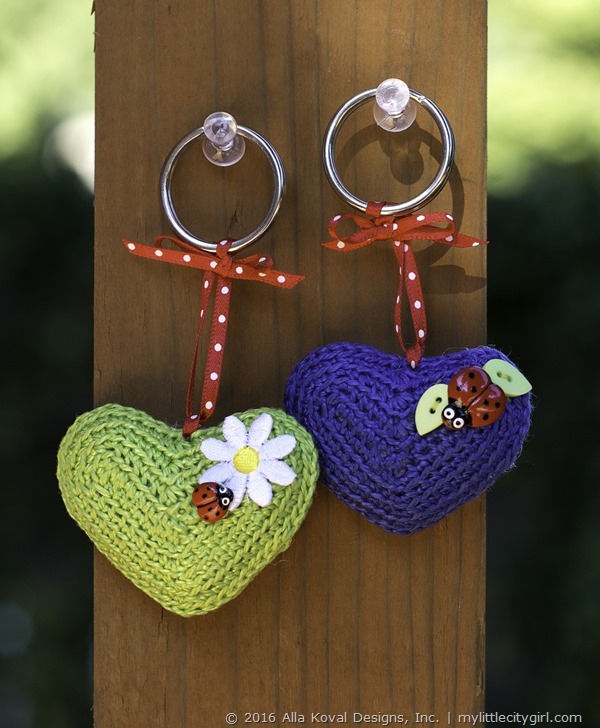 And they are fun to make and sure bring a smile to the lucky wearer! 16 (18, 20.5, 23)” (41 [46, 52, 58.5] cm) head circumferences.